I think that just as awesome as those doughnuts were, are the memories that I treasure of making them. I thought my mom was a hero for being able to concoct something so wonderful. I remember finding out that my mom and sister had made them while hanging out just a few years ago. Me, being a 4 hour drive away felt completely crushed and left out. LOL! There I was, in my late 20's, and pouting because I was left out of the all important doughnut making. Last week, it dawned on me that maybe my daughter Roslyn is old enough to take on the role as official glazer. So we made doughnuts. Lotsa, Lotsa doughnuts, as my daughter would say. I wish I could say I created this recipe, but I didn't. Nor is it the recipe from my childhood, as my mom and dad are currently fishing in British Columbia, and these doughnuts couldn't wait. But good news!!! This recipe is as good as (eeek, maybe a bit better than), the one my mom would make. I found it on allrecipes.com. Here is the link to it: My Mom's Raised Doughnuts. I have re-written it here with my adaptation of the method and a couple ingredient tweaks, below. -Place the milk and Crisco in a small saucepan, and stir on low heat until the shortening melts and small bubbles start to form around the mixture. DO NOT BOIL. -Add the yeast mixture and eggs to the milk/sugar/salt mixture. With the dough-hook attached (if you have one, add one cup of flour and beat until smooth. You could also easily do this by hand. Continue adding the next 3 cups of flour, one at a time, until a soft dough forms. -Turn out onto a floured surface and knead about 2 minutes, until smooth and elastic. At this point, my dough was so soft and smooth it really didn't need much more than this. -Allow the dough to rise in a greased bowl for about 1.5 hours. It should be just a little over double in size. -Punch dough down and roll out to about 1/2 inch thickness on a lightly floured surface. 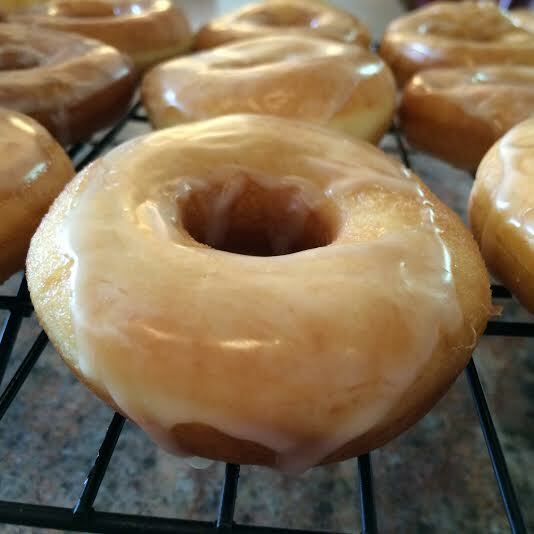 Use a 3.5 inch round glass, can, or doughnut cutter, and about a 1 inch cutter (a lid from a 2L soda bottle works well) to cut out your doughnuts and middles. Allow to rise where you cut them (covered with a tea towel) for about 45 minutes. -I used a small heavy pot with about 2.5 inches of oil in it to fry. Heat the oil to 350F, and drop in 2 at a time. You will only need to fry for about 30 seconds per side. The original recipe said a couple of minutes, but that would have been too long for me. *I doubled both the extract and water quantities from the original recipe. Excellent job being the glazer, Roslyn!